Public defense took place on June 8, 2016, in the Aula of the University of Amsterdam. All over the world, people make music together. The process that allows us to synchronize to music is beat perception. In this dissertation, I explore the ingredients that are necessary for us to perceive a beat in musical rhythm. 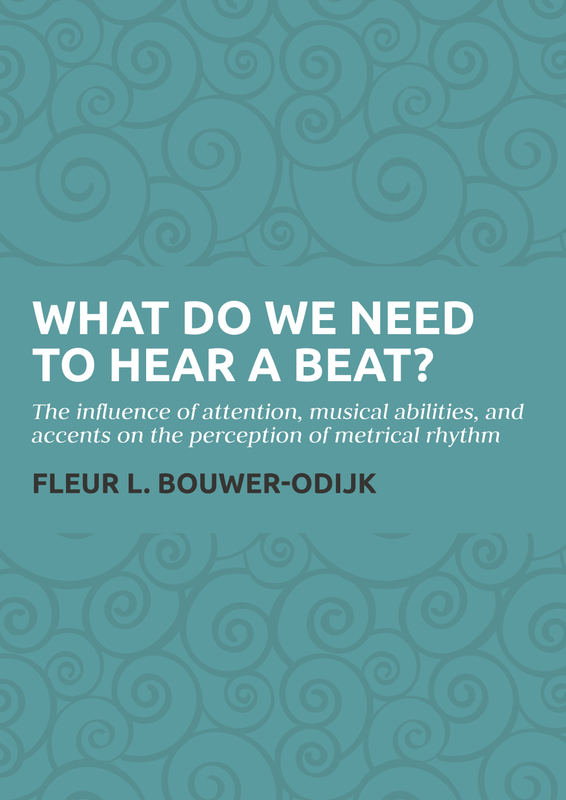 I examine how beat perception is affected by attention, musical abilities, and the type of accent that indicates the beat in a rhythm. Additionally, I examine the processes underlying beat perception, and I address several methodological issues that arise when probing beat perception with event-related potentials (ERPs). A beat can be inferred from the structure of accents in a rhythm. Using a web-based setup, we show that musical training increases the sensitivity of a listener to the structure of accents in rhythm. We also show that listeners respond qualitatively differently to rhythms in which the beat is indicated by the temporal grouping of events and rhythms in which the beat is indicated by intensity increases. Once a beat is inferred from a rhythm, a perceived beat influences processing of subsequent rhythmic events. Using a speeded detection task, we show that this influence can be characterized both by temporal fluctuations in attention and by temporal predictions. The former enhances processing of events that coincide with the beat, while the latter enhances the detection of events that are unexpected. In several experiments, we use EEG to examine beat perception when listeners do not attend to a rhythm. Beat perception is thought to influence early auditory processing of rhythmic events. This influence can be indexed using ERPs. In a group of highly trained musicians, we provide evidence for the presence of beat perception when attention is directed away from a rhythm. We show that the P1 response, which is an obligatory ERP response to sound, is larger for events on the beat than for events off the beat. In two subsequent EEG studies, we probe beat perception by measuring ERP responses to prediction violations occurring both on and off the beat in metrical rhythms. Several well-studied ERP responses are known to index the magnitude of prediction violations, including the mismatch negativity (MMN) and the P3a response. We show that even when attention is not directed at a rhythm, unexpected silences and intensity decreases elicit larger ERP responses on the beat than off the beat. This supports the view that beat perception is possible when attention is directed away from a rhythm. Musical training only enhances the effects of beat perception on ERP responses to unexpected rhythmic events when attention is directed towards the rhythm. Together, the collection of studies presented here provides a nuanced picture of the conditions under which we are capable of perceiving a beat in music. Beat perception may be possible when attention is directed away from a rhythm, but attention may interact with the effects of musical training on beat perception. Likewise, the type of accents present in a rhythm can influence how easy it is to perceive a beat, but this may depend on musical training. Throughout this dissertation, I show that when probing beat perception with ERPs it is important to differentiate the effects of beat perception from other factors that may influence the magnitude of ERP responses, such as acoustic variation in a rhythm and predictions that are generated through statistical learning of a sound sequence. Finally, I propose that beat perception can be regarded as an ability that consists of several different mechanisms that together allow us to synchronize to music. Download my full dissertation here.